When the conditions for fishing aren’t ideal and playing the card game Go Fish becomes more tedious than thrilling we recommend heading online via your desktop, laptop, smartphone or tablet to play the best fishing themed slots for real money bets. Playing with real money on Internet pokies can offer the same feeling you get when you feel a nibble on the hook, and with so many great seaside themes available at our favourite online gaming establishments, you can get your fishing fix easily while waiting for the conditions to become suitable to reel one in. This slot machine by Microgaming will take you on an exciting fishing trip while you sit in the comfort of your own home, or wherever you have an Internet connection, with the added bonus that you remain dry. The format features 243 ways to win meaning with every spin there is more possibilities to win than your standard slots machine. While the weather may be less than desirable from where you are playing, the game takes you onto a boat on a hot sunny day with a gold trophy to win and fish to catch. 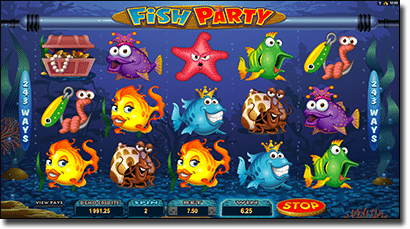 This pokies features free spins and additional bonuses that a fishing line couldn’t catch. Featuring boats, tackles, scales and trophies as well as the king, Queen, Jack, 10, nine and the Ace. 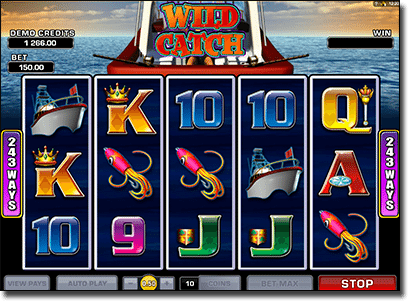 Wild symbol – The wild feature is triggered when you spin the wild symbol which is the marlin, which has a creepy smile, on the middle three reels and you win five free spins with additional spins being won every time the marlin symbol appears during the wild feature. Scatter symbol – The fisherman are the scatter symbols and if you land three to five of these you can win 10 to 20 free spins which means there is a chance to win a maximum of 50,000 coins overall. Multipliers – A wild win symbol, not to be confused with the wild marlin symbol sees a stacking multiplier applied. The more wild win symbols the higher the multiplier with it reaching up to 10x. Overall this is a fun pokies game with more ways to win and the chance to experience a thrill while remaining true to trade of fishing. Additionally, the multiplier makes the game worthwhile. This Net Entertainment video slot offers a theme which will intrigue fisherman around the world, but maybe more so Aussies as they would rarely experience an icy fishing trip. With a snow fishing theme, the 5 reels and 15 paylines slots offers interesting animations of fish below the frozen ice, as well as offering players the potential for some pretty good payouts. Sticky wilds – The hook, or the fishing lure, is the wild and can replace any symbol except for the scatter symbols, as standard wilds do, and are sticky so they remain when you land the feature meaning bigger wins. Scatter symbols – If you get the long, thin, grey fish you’ve landed a scatter and if you get three to five of these you can win five to 15 free spins, respectively. If a sticky wild has occurred before this then they will stick around during these free spins so you can win even more. Skill stop – This is an interesting feature which may be good for players with fast reaction times. There are little revolving arrows on the spin button which means you can start and stop the reels whenever you can, or want. It may be useful to some, but others you can still let the reels spin on their own just steer clear of the little arrows. Overall this slots machine is an intriguing one with the bonus feature for players to try their skills out on in terms of stopping the reels. Additionally, the audio itself almost makes you want to go out on an icy fishing endeavour, which is something we don’t recommend for the amateur fisherman. This pokies literally makes you feel as though you are sitting out in your little dingy, waiting for a bite, with the audio of lapping water and the occasional wave breaking creating the ambience. While the fish aren’t ones you’d expect to catch, there are crabs making this ideal for a crab catcher enthusiast or even someone who wants to catch Nemo with clown fish making an appearance. This slot machine is by Play’n Go, who specialise in making slots specifically for the mobile platform – meaning this one is available at our recommended Play’n Go mobile casinos. Format – Featuring 5 reels and 20 paylines with crabs, tropical fish, sea turtles, oysters which reveal prizes, and seahorses, along with the Ace to 10 symbols lining the reels. Wild symbol – The dolphin acts as the wild symbol and replaces any symbol except for the scatter, as well as doubling any winning line it features in. If you get five dolphins on the reels you will win 5,000 coins. Scatter symbol – The oyster which opens up and bears prizes when triggered is the scatter symbol and if you get three to five of these you get free spins. With up to 15 free spins to score, there is also a 3x multiplier which comes with the free spins up to three times. We did the math for you and this means you can win up to 180 free spins. This pokies is great for the 5,000 coins winning potential though that isn’t that large, so if you play this game for anything it’s the soothing noises which will remind you of being on the ocean, fishing rod in hand – though we play it for the best chance to get some free spins. Fancy a fish party? This 243 ways pokies is a good option for those who want a bit of novelty in their game. While its not necessarily fishing, it does give you a funny and animated insight to what happens under the sea. The 5 reel slot may have funny symbols and somewhat annoying audio but it does have a very large jackpot which could easily attract experienced players, so don’t be so quick to pass this one off due to its graphics and accompanying soundtrack. Wild symbol -The wild symbols are represented by the Fish Party logos and will show up on all of the reels so players have the opportunity to win in multiple ways. Scattered symbols – The shells are the scattered symbols and unlike all the aforementioned games there is no set amount of free spins to symbol ratio but you do need to get three or more to get a random number of up to 20 free spins. Red/black or suits -The interesting thing about this title is it offers a chance to gamble any winnings you may have made on either red or black, or between the suits which only adds to the thrill of the game. There is no multiplier in this game which is a drawback, but overall it is a fun and interesting pokies title with a unique betting option for those after something different. If you have headed for a fishing trip away but found the conditions have kept you inside with nothing but your smartphone or tablet, you are still in luck despite the circumstances. 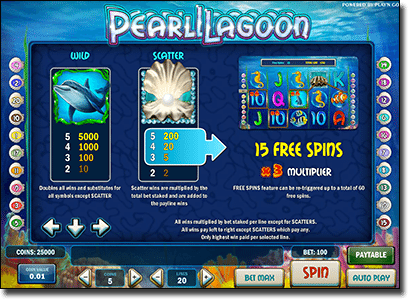 Play’n Go make mobile specific titles, including Pearl Lagoon, which you can access via your mobile browser such as Safari, Firefox, Chrome and more, while NetEnt’s Lucky Angler, Microgaming’s Wild Catch and Fish Party are all available to play via smartphones and tablets at all of our recommended online casinos. 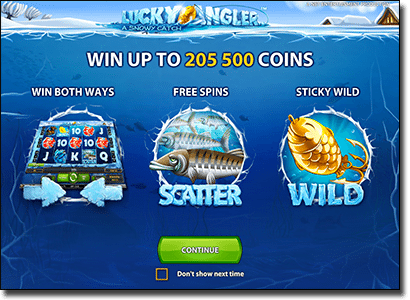 Sign up for an account with Slots Million to play fishing themed pokies for real money on your desktop or mobile, along with over 1800+ other instant-play slot games.